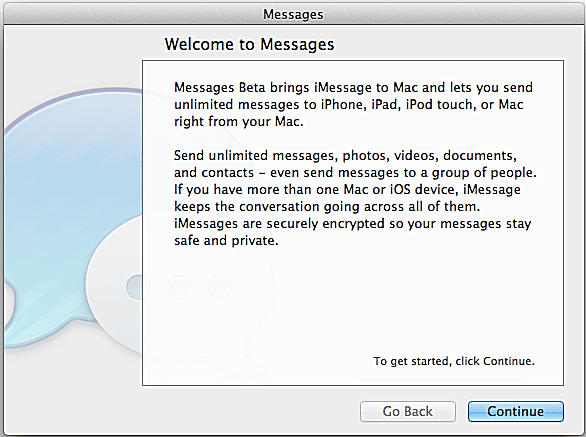 After installing your Messages for Mac download and opening the instant messenger software for the first time, you will find prompts to create your own Messages account. With a Messages account, other users can send you unlimited instant messages, photos, videos, documents and contacts right from the Mac, or using iMessages on iPhone, iPod Touch or iPad. To start creating your new account, click the glass blue "Continue" button in the bottom right corner of the window, as illustrated above. In the steps below, you'll learn how to create a new account as well as how to add accounts from your other messaging services. To set up your Messages for Mac instant messaging client and start using the software, you must sign in with your Apple ID and password. In the fields provided, enter your account email address and password, and click the glass blue Continue button. If you have cannot recall your password, click the silver Forgot Password? button and follow the prompts. If you do not have an Apple ID, which is one of the accounts you can use to access Messages for Mac, click the silver "Create an Apple ID... button to make one now. Once complete, click the silver Create Apple ID button to continue. A dialogue box will appear prompting you to check your email for a verification email. Login to your email account and click the link in the email to finish creating your new Messages account. Click the glass blue OK button to exit the dialogue box. Find Preferences in the drop-down menu, as illustrated above. Choose Preferences to open the menu window on your desktop. Once the Preferences window has opened, click the Accounts tab. You will notice in the Accounts field, your Messages for Mac/Apple ID appear in your list, along with Bonjour. Locate the + button in the lower left corner underneath the Accounts field to start adding additional accounts to Messages for Mac. Messages for Mac allows you to access multiple accounts from AIM, Gtalk, Jabber clients and Yahoo Messenger from your buddy list. Once you've clicked the + button from your Messages for Mac accounts window in Preferences, you are able to add AIM and other instant messaging accounts to the program. Click the drop-down menu and select AIM, then enter your screen name and password in the fields provided. Click the glass blue Done button to continue. If you have multiple AIM accounts to add, repeat the instructions above until all your accounts have been added. Messages for Mac can support multiple AIM accounts at one time. Once you've clicked the + button from your Messages for Mac accounts window in Preferences, you are able to add Google Talk and other instant messaging accounts to the program. Click the drop-down menu and select Google Talk, then enter your screen name and password in the fields provided. Click the glass blue Done button to continue. If you have multiple Google Talk accounts to add, repeat the instructions above until all your accounts have been added. Messages for Mac can support multiple Gtalk accounts at one time. Once you've clicked the + button from your Messages for Mac accounts window in Preferences, you are able to add Jabber and other instant messaging accounts to the program. Click the drop-down menu and select Jabber, then enter your screen name and password in the fields provided. You can also click the Server Options menu to define your server and port, SSL settings, and enable Kerberos v5 for authentication. Click the glass blue Done button to continue. If you have multiple Jabber accounts to add, repeat the instructions above until all your accounts have been added. Messages for Mac can support multiple Jabber accounts at one time. Once you've clicked the + button from your Messages for Mac accounts window in Preferences, you are able to add Yahoo Messenger and other instant messaging accounts to the program. Click the drop-down menu and select Yahoo Messenger, then enter your screen name and password in the fields provided. Click the glass blue Done button to continue. If you have multiple Yahoo Messenger accounts to add, repeat the instructions above until all your accounts have been added. Messages for Mac can support multiple Yahoo accounts at one time.